Pure Book of Mormon Awesomeness! While evading King Noah’s spies, Gideon and Alma launch a daring revolution to overthrow the tyrannical king. But a Lamanite army is advancing toward Shilom. Will Zerin be able to save her mother from the doomed city? Can Sybil lead Alma’s converts to safety? Packed with action, laughs, and inspiration, iPlates brings pure Book of Mormon awesomeness to your whole family. This collection is based on Mosiah 12–13. 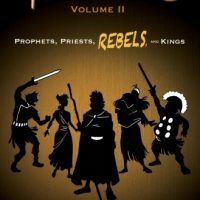 NOTE: This volume takes “iPlates: Volume 2: Part I: Alma in the Wilderness” AND “iPlates Volume 2 Part II: Gideon’s Revolt” AND joins them together with a new story, “Zerin’s Sacrifice“. That’s THREE stories for less than the price of TWO, because we’re offering an INTERNET SPECIAL below. LISTEN to the interview done by Nick Galieti on “The Good Word”, a radio podcast sponsored by Radio Gold Productions, Custom LDS Scriptures and Eborn Books by clicking on this LINK. If you are a bookstore or other reseller and wish to carry this title, please contact us directly. You can order directly from us with full return policy and standard trade discounts by email. A purchase directly from us will get you listed on this page (above).